Astronomers, including a NASA-funded team member, have discovered a new class of Jupiter-sized planets floating alone in the dark of space, away from the light of a star. The team believes these lone worlds were probably ejected from developing planetary systems. The discovery is based on a joint Japan-New Zealand survey that scanned the center of the Milky Way galaxy during 2006 and 2007, revealing evidence for up to 10 free-floating planets roughly the mass of Jupiter. The isolated orbs, also known as orphan planets, are difficult to spot, and had gone undetected until now. The newfound planets are located at an average approximate distance of 10,000 to 20,000 light-years from Earth. The discovery indicates there are many more free-floating Jupiter-mass planets that can't be seen. The team estimates there are about twice as many of them as stars. In addition, these worlds are thought to be at least as common as planets that orbit stars. This would add up to hundreds of billions of lone planets in our Milky Way galaxy alone. The study, led by Takahiro Sumi from Osaka University in Japan, appears in the May 19 issue of the journal Nature. The survey, the Microlensing Observations in Astrophysics (MOA), is named in part after a giant wingless, extinct bird family from New Zealand called the moa. A 5.9-foot (1.8-meter) telescope at Mount John University Observatory in New Zealand is used to regularly scan the copious stars at the center of our galaxy for gravitational microlensing events. 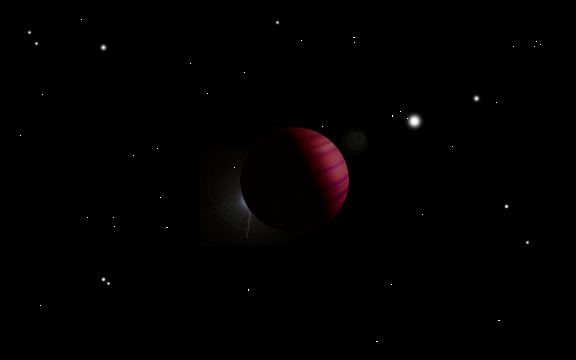 These occur when something, such as a star or planet, passes in front of another, more distant star. The passing body's gravity warps the light of the background star, causing it to magnify and brighten. Heftier passing bodies, like massive stars, will warp the light of the background star to a greater extent, resulting in brightening events that can last weeks. Small planet-size bodies will cause less of a distortion, and brighten a star for only a few days or less. NASA's Jet Propulsion Laboratory, Pasadena,Calif., manages NASA's Exoplanet Exploration program office. JPL is a division of the California Institute of Technology in Pasadena. More information about exoplanets and NASA's planet-finding program is at http://planetquest.jpl.nasa.gov.